Guest post by Siobhan McGuinness. Siobhan has presented at library conferences such as ASL and CDG. In addition, she enjoys writing blog posts for library organisations. “The First Rung on the Ladder: Applications, interviews and first experiences as a New Professional” #npdi16. Presentations and panel discussion with experienced librarians from a variety of fields. In writing pat two I want to take this opportunity to thank the NPDI Team and expert panel for giving students and new library and info pro’s the chance to gain insight into how our library leaders handle the complex nature that is recruitment. Having the opportunity to reach out and be given the space to verify what you are doing, and be reassured you are doing it correctly is a great boost when job hunting. The enthusiasm and support shown to the audience that day was second to none, job hunting can be a lonely place at times and it is good to know people are looking out for you. In all interview situations, people being interviewed forget that the interviewees are human. We show very little of ourselves other than what we have been asked and how each experience relates to our C.V. and the job description. In some cases, the interviewees want to see a potential colleague, someone they can imagine having a cup of tea with in the canteen. In doing this you need to show your best self, you can shine in 30 minutes. One helpful tip, remember your social media accounts, don’t go posting any information about an interview before or after. Shelia Kelly, Dublin City Library & Archive. One of the many important messages I took away from npdi16 was the importance of practising your interview, talking out your experiences. This creates your story, and how this story matches the job description and the person the panel require. Having to talk out your examples, the positive and negative to others lets you see the gaps in your story, the pieces that don’t add up. It also gives you a confidence when telling your story to the panel, as the saying goes, practice makes perfect (until nerves kick in). Marie O’Neill, Dublin Business School. To students currently doing their capstone or thesis, have an aim in mind to get it published, this will help you stand out. If you find that there are gaps between jobs, always upskill, always be learning and adding to your CPD. At interview stage show the panel you have bought into the organisations ethos and culture, make them understand how you value and appreciate this element. Marie believes that there should be a formal mentoring network set up, where librarians can register to mentor graduates/early career librarians as required. Marie has the most amazing ideas and I do hope they become a reality, the one I think we really need is a dedicated jobs fair for LIS professionals, because there are many companies and organisations out there, including recruitment companies that disregard our skills because they only see “the librarian in the library”. Catriona Sharkey, Ernest and Young. Know the opportunity the job will give you, and give it your all. Do your homework, know the organisation, the ethos of the library, their strategic plan the annual report. You name it, know it as Catriona states this is “Forensic research”. Study the job description this is generally going to be the questions you are going to be asked, test yourself to prepare yourself. The discussion was mainly aimed at two areas, social media and the final question you are asked in an interview “Do you have any questions”? Social media is always a mine field, just be careful and always think that potential employers are viewing it to see your interests and hobbies. A lot of librarians use “opinions are my own” in their bio, which can be useful. Do you have any questions? The advice given is to be aware of the context, if you’re not sure about asking it, don’t ask it. One of the panel suggested, any queries you have email the point of contact you have from HR. Marie also pointed out to use this time at the end as an opportunity to thank the panel for their time and the opportunity to be interviewed, which I think is a fabulous way to end any interview. Guest post by Siobhan McGuinness Siobhan has presented at library conferences such as ASL and CDG. In addition, she enjoys writing blog posts for library organisations. The team that run New Professionals Day Ireland deliver very important and relevant events for New Professionals. The focus this year being “Applications, Interviews & First Experiences of New Professionals”. The job hunt is tough, something akin to the hunger games in my experience which of course is played out in my mind, not reality. Library and Information Professionals know they have a wide range of skills, not all of those skills get the proper use in college. You are thought the theory and the practice yet with only a limited amount of experience when you graduate, it is difficult to secure that first job. If you know what you want during the college term, really dedicate your time to finding out the sector or skill you wish to advance in and you will succeed. Like Caroline Rowan our first speaker, she carefully planned where she wished to see herself, a medical librarian. The advice Caroline gives is one of an action plan, take a step back, look at where you see yourself, think about the plan ahead. When applying for jobs that are short term contracts always ask yourself where will this job take me on my long-term goal? Have these answers ready before you apply. The application is a long and tedious road, and they are all different. Be aware of the different formats, inform yourself of things like Garda vetting, all the addresses you lived in will need to be identified. Different jobs require different CV’s, so be prepared to rewrite everything. Have that master CV, it will help you in the long run. The next step is the interview, this is a huge pat on the back. It means your CV works and is what the organisation wanted. Now it is for you to prepare, hold on to the job descriptions as this is vital information to you. Prepare yourself more, forearmed is forewarned as they say. Email (very nicely) to the HR personnel and ask them the interview process, information like how many will be on the panel and who they are, what type of interview will it be? Next up was the first of four lighting presentations, Gary LaCumbre led the way with his presentation “The elusive middle ground: over qualified and under experienced”. This is where I sit, in nearly all my interviews the lack of actual library experience is always a disadvantage to me. It is disheartening to have a Master’s degree and still find yourself applying for jobs at an entry level, because you don’t have the necessary experience. It is even more difficult to be told that you are over qualified for posts, because the organisation do not accept qualified professionals at entry level posts. Gary says, no matter what post you are successful in always make sure you get involved with other projects, maximise your skillset so that when you find yourself once again job searching you “have travelled outside of your own job description”. A wonderful presentation and very heart-warming for those of us who are constantly searching. Niall O’Brien followed with “Learning at the Information desk”. Here Niall teaches us to build a relationship with your users, get to know them, their interests. In essence even though you are doing a “job” you are doing the job you love so let that show when dealing with users, this is such an important message and one that we often forget, so thank you Niall. While you build this relationship, you teach them how to answer their own research queries, you give them the tools. Assess how you interact with your users, does the information desk look like a wall, a barrier, or is it a welcoming space an informal space that makes the user comfortable. Always make the experience something that the user will use and learn from. Anita Cooper began her presentation with the fab title “A librarian gets into a taxi…and guess what happens next? Anita tells us the story of how in the most unexpected circumstances she secured an internship with Dublin Business School Library, with the lovely Marie O’Neill. Now that she has graduated and is on her search to secure a library job, she says to keep an open mind. You need to always believe that when you are in the right place at the right time things do happen. Anita says if her husband had not met Marie and told her the story of the difficult choice Anita was making regarding changing careers and becoming a librarian. If happenstance had not occurred she would hate to think where she would have ended up, or even worse abandoned her dreams. Don’t lose faith, we all know this is what we want so keep going, because we will get there. Lastly, we have Jesse Waters “My first year out of Library School” these amazing achievements in just one year goes to show that dedication and drive really does pay off. Jesse says in order to keep your mental health healthy in between jobs, job searching and the mountain of rejections, is to concentrate on your Continuing Professional Development. Look for seminars and conferences that you can present at, be a lightning talk or a poster presentation it helps you focus on your profession, and reminds you that you love what you are doing. While looking after your mental health, network and this keeps you in touch with everyone, opportunities arise from these meet up’s. The high standard of presentations at npdi16 was incredible, to all of the brand-new, new library and informational professionals keep doing what you are doing because it will stand to you. All you need is patience and time, just remember to have fun along the way! Part two can be read here . The inaugural UCC Library Seminar took place on Tuesday, November 15th, and was possibly the most thought provoking library event I have attended this year. It focused on User Experience and on new ways of thinking about library services. All four speakers posed controversial questions, rattled a few cages, and altogether made us re-assess how we think about what libraries do and who our users are. The opening talk, entitled ‘Invisible users: Libraries and the messy practices of academia’ was by Donna Lanclos, Associate Professor for Anthropological Research at Atkins Library, in the University of North Carolina Charlotte. Donna has carried out ethnographic research on user experience in the libraries of U.S. and European universities, asking users to map their activity in order to understand where learning occurs during their busy lives, and what their digital practices are. An interesting project called ‘A day in the life’ involved students and academics from several U.S. and European colleges tweeting about where they were, what they were doing and how they felt at various times of the day. The results of these mapping and ‘day in the life’ projects paint a fascinating picture of where students learn, how they use digital resources in their learning, and where the library fits into all of that. The first lesson from these projects is that there is no such thing as ‘invisible users’. They are far from invisible: we are simply not looking in the right places, because libraries are just one of the possible learning spaces they use. In other words, libraries must stop thinking about their ‘users’ and start trying to understand their communities. The second lesson is that students and researchers in similar institutions in the Western world are not that different from one another: they tend to look for spaces with access to food and good coffee, wifi, easy parking and quiet to study. Their learning spaces tend to be places where they can also meet friends, or that are close to their child’s crèche, or that have some other social/ convenience aspect, and they often use public transport as a learning space –particularly if they live in a noisy student apartment or they have children at home who distract them from their study. Rather than replicating UX studies that have already been done elsewhere, we should learn from them and apply their conclusions to our own libraries, trying out initiatives but avoiding ‘solutionism’, as there are often no tidy solutions to the messy complexity of academic lives. Donna cautioned against using the results of these studies as a means of fuelling the metrics-based culture so prevalent in our institutions. Instead, she called for a richer, more qualitative narrative, which makes clear the contribution of academic libraries to the well being of our communities, without reducing it to simply a matter of numbers. The second talk, entitled ‘Consciously Connecting: a snapshot of CIT Library initiatives enriching the User Experience’, was by Jean Ricken, Institute Librarian at the Cork Institute of Technology. Jean discussed new initiatives aimed at providing a more consistent and relevant library service across all different campuses of CIT, which includes students at the Marine Institute who may be literally at sea when trying to access library resources. She talked us through the re-design of the CIT library website, and provided ideas for engaging students with the library site such as an online ‘scavenger hunt’ with a ‘golden ticket’ prize. Jean also talked about how to solve signage issues [colour coding resources and linking to a strong logo], tackle noise problems in the library when there is little budget for it [remove partitions between desks] and told us that creating bookable spaces for group study has been extremely successful. As well as re-designing the library website and the physical spaces, CIT libraries also set about re-thinking their library induction, and collaborated with the broader institution in the Good Start induction programme to engage first year students with the Library. Jean’s main message was that communicating the library’s user experience plans to colleagues outside the library can bring substantial benefits, both by making the wider academic community aware of what the library can offer, and by engaging students with the library. After a lovely lunch break with delicious food and a tour of the fabulous Boole library, the afternoon started with Matt Borg’s talk, ‘A matter of perspective. 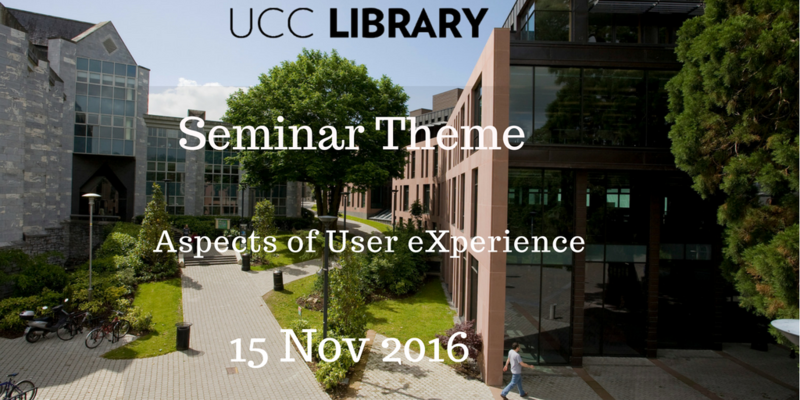 User Experience, Libraries, Human Centred Design and You’. Matt is Senior Librarian and Solution Expert at Ex Libris in Sheffield, and his talk analysed how a change in perspective can have a large impact on library services. He illustrated this by looking at the experience of H-Day, September 3rd 1967, when the Swedish changed the side of the road on which they drove. Although there was extensive planning for the event, with education, extensive media campaigns and preparation for possible problems, the planning process did not take into account how the change would affect entire journeys, and as a result people got lost: the planners had not seen the event through the eyes of road users. Matt emphasised that we as librarians are not our users: we don’t spend as much time in the library itself as they do, and therefore we don’t know enough about their experience of it. Library surveys are usually filled in by experienced users, and don’t tell us how the average user feels about the service. Matt discussed a number of UX techniques such as behavioural maps, visitors and residents diagrams, cognitive maps, interviews, usability testing, graffiti walls, love/ breakup letters, and touchstone tours that can provide a glimpse of the users’ perspectives. However, he also noted that these techniques can also lead to bad UX studies, and pointed out how design often fails to take into account real-life use. Perhaps the most egregious example of this was the ‘Too cool to do drugs’ pencils used in an anti-drugs campaign which, when sharpened, could be made to say ‘cool to do drugs’. Clearly, the designers had not sharpened their own pencils when planning the campaign! Matt’s main conclusion was that libraries are about connecting people with resources, and human-centred design can help deliver a more meaningful service that caters to the needs of our communities. The final talk of the day was by Fiona Greig, Head of eStrategy & Resources at the University of Surrey Library. Entitled What does a future oriented library look like in terms of staff roles, flexibility and adaptability?, Fiona’s talk made some controversial statements which at times left us feeling uncomfortable, yet knowing that those questions need to be asked. She started by pointing out that, although online resources attract the highest percentage of traffic in most libraries, this is rarely reflected in staff allocation. Fiona advocated strongly for streamlining library operations to provide excellent online service, so that expert staff can then be freed up to focus on making the unique collections of the library available digitally, and on providing the type of training and research support that requires face-to-face contact. Fiona believes that physical collections of contemporary material must ‘earn their keep’ in order to justify their space on the shelves, and that anything that can be offered in digital form successfully should be. She called on library vendors to make their data open and available for mining, in order to improve the searchability of electronic resources, and she also highlighted the need for leadership from library management to negotiate forcefully with vendors for improved offerings in digital form. Finally, she highlighted the need for flexible and adaptable staff, calling on library leaders to foster a culture of adaptability, encourage staff to branch out into new areas and promote meaningful professional development. Libraries must stop thinking about users and start engaging their whole communities. We are about connecting people with resources, and sometimes those resources can also be other people. We are not our users, so in order to understand their needs we have to step into their shoes. We should focus on complementing what’s already available online, rather than trying to replace it – we are not Google, but we can be something else equally necessary. Librarians must be flexible and adaptable, and library leaders should foster these qualities in their employees. I would like to thank the entire UCC library team involved in organising this seminar – they thought of everything, including providing phone chargers for attendees [impressive or what?]. I am also really looking forward to next year’s!